This ultra deep carving is but one of a series of 4 that I produced in order to illustrate the various styles and techniques involved with bas relief sculpture. Carved from a sawn block of solid and consistent Kansas Creme limestones, each of the four carvings are freestanding and extremely durable. 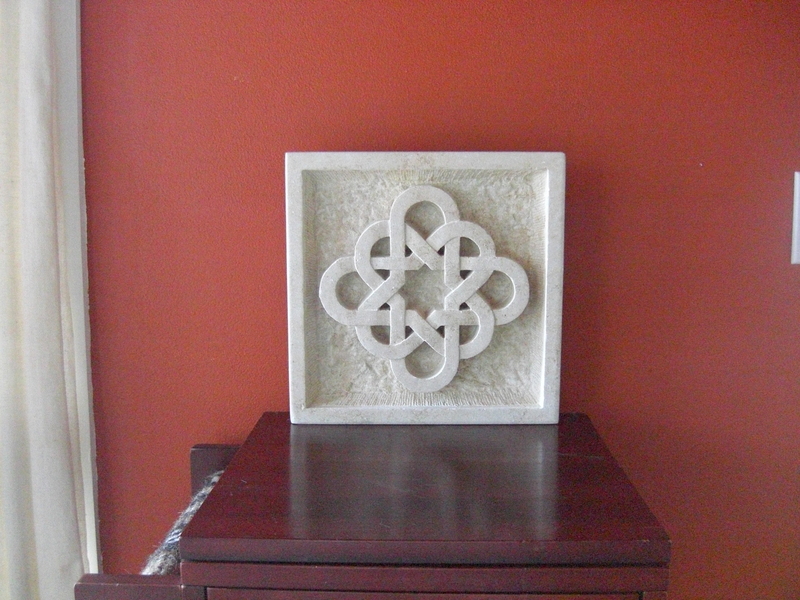 This entry was posted in All Postings, Gallery of Limestone Sculpture, Gallery of Sculpture, Gallery of Sculpture FOR SALE, Posts about my Sculpture and tagged Art, Artist, Aspen, Bas Relief, Colorado, decorative panel, dharma wheel, eternal knot, for sale, Hand Carved, limestone, Martin Cooney, sculptor, Sculpture, Stone, studio gallery, Woody Creek. Bookmark the permalink.